Damaged buildings are seen after gunmen stormed a television station near Damascus Tuesday, in this photograph released by Syria&apos;s national news agency SANA. BEIRUT (AP) — Gunmen attacked a pro-government TV station Wednesday near the Syrian capital, killing seven employees in the latest barrage of violence as world powers prepared for a high-level meeting that the U.S. hopes will be a turning point in the crisis. Invitations to Saturday’s gathering in Geneva were sent by special envoy Kofi Annan to the five permanent members of the U.N. Security Council — including Syrian allies Russia and China — but not to major regional players Iran and Saudi Arabia. The absence of those two countries, as well as the lack of any appetite for international military intervention, could make it difficult for the group to find the leverage to end the bloodshed in Syria. An effort by Annan to broker a peace plan failed earlier this year. Diplomatic hopes have rested on Russia — Syria’s most important ally and protector — agreeing on a transition plan that would end the Assad family dynasty, which has ruled Syria for more than four decades. But Moscow has rejected efforts by outside forces to end the conflict or any plan to force regime change in Damascus. The United Nations said Wednesday that the conflict, which began in March 2011 as part of the Arab Spring that swept aside entrenched leaders across the region, is descending into sectarian warfare. The bloodshed appears to be taking on dangerous sectarian overtones, the UN said, and government troops could be behind last month’s killing of more than 100 civilians. President Bashar Assad has so far appeared largely impervious to world pressure and he has warned the international community from meddling in the crisis, which has seen a sharp escalation in violence in recent months. He said this week that his country is in ‘‘a genuine state of war,’’ an increasingly common refrain from the Syrian leader. Assad denies there is any popular will behind the uprising, which is in its 16th month, saying terrorists are driving a foreign conspiracy to destroy the country. Activists say more than 14,000 people have been killed in the violence. An Associated Press photographer said the attack on the Al-Ikhbariya TV station in the town of Drousha, about 20 kilometers (14 miles) south of the capital Damascus, left bloodstains on the ground and bullet holes in the walls. The attack heavily damaged five portable buildings used for offices and studios. Al-Ikhbariya is privately owned but strongly supports the regime. ‘‘What happened today is a massacre,’’ Information Minister Omran al-Zoebi told reporters. He blamed terrorists — the same term the government uses for rebels. The rebels deny they target the media. 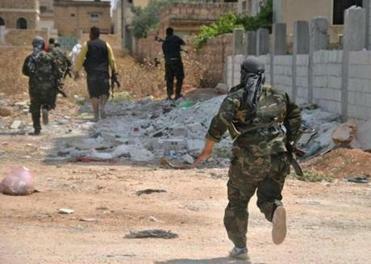 Activists blamed the attack on elite Syrian troops who defected from the regime Tuesday. The allegation could not be independently confirmed. Several other staff members of the TV station were wounded in the attack, which happened just before 4 a.m., an employee said. He added that the gunmen kidnapped him along with several station guards. He was released but the guards were not. The employee, who did not give his name for fear of retribution, said the gunmen drove him about 200 meters (yards) away and he then heard an explosion from the station. ‘‘I was terrified when they blindfolded me and took me away,’’ the man said by telephone. Hours after the attack, the station was still on the air, broadcasting news of a rally in a Damascus square by people protesting the raid. Earlier this month, two Al-Ikhbariya employees were shot and seriously wounded by gunmen in the northwestern town of Haffa while covering clashes between government troops and insurgents. Much of the violence that has gripped Syria in the uprising has been sanctioned by the government to crush dissent. But rebel fighters are launching increasingly deadly attacks on regime targets, and several massive suicide attacks this year suggest al-Qaida or other extremists are joining the fray. On Wednesday, the U.N. gave a grim assessment of the crisis, saying the violence has worsened since April, when the cease-fire brokered by Annan was supposed to go into effect. There also were signs the bloodshed is descending into sectarian warfare. ‘‘Where previously victims were targeted on the basis of their being pro- or anti-government, the Commission of Inquiry has recorded a growing number of incidents where victims appear to have been targeted because of their religious affiliation,’’ a panel of U.N.-appointed human rights experts said in a report released in Geneva. Sectarian warfare is one of the most dire scenarios in Syria, which for decades managed to ward off the kind of bloodshed that has long bedeviled Iraq and Lebanon. Sunnis make up most of Syria’s 22 million people, as well as the backbone of the opposition. But the Assads and the ruling elite belong to the tiny Alawite sect, an offshoot of Shiite Islam, which has bred deep resentments. 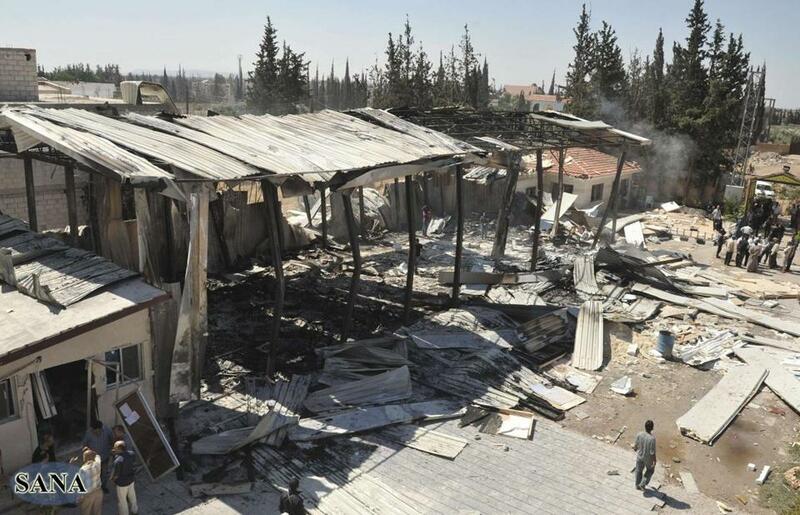 Several notorious attacks during the uprising appeared to have sectarian overtones — including the Houla massacre in May, when more than 100 people were killed in a collection of villages in central Syria. He said the probe into the Houla massacre concluded that forces loyal to the regime ‘‘may have been responsible’’ for many of the deaths. Investigators have said pro-regime, Alawite gunmen known as shabiha were believed to be responsible for at least some of the killings. Houla leans toward the opposition, and most of the victims were women and children who were slain in their homes, the report said. ‘‘The manner in which these killings took place resembles those previously and repeatedly documented to have been committed by the government,’’ Pinheiro told the U.N.’s top human rights body in Geneva. The U.N.’s deputy envoy for Syria, Jean-Marie Guehenno, told the Human Rights Council that the violence has ‘‘reached or even surpassed’’ levels seen before the April 12 cease-fire. Fayssal al-Hamwi, the Syrian ambassador in Geneva, said the allegations against the government are ‘‘quite fantastic.’’ Calling the council meeting blatantly political, he said he no longer wished to participate and strode out in protest. U.S. Secretary of State Hillary Rodham Clinton said she has ‘‘great hope’’ that the Geneva meeting can be a turning point in the crisis. Annan, who represents the U.N. and the Arab League, said he sent invitations to Britain, China, France, Russia and the United States — plus Turkey, Iraq, Kuwait and Qatar, and the European Union. The absence of Iran and Saudi Arabia is significant because they support opposing sides of the conflict. Iran is one of the regime’s top allies, and Saudi Arabia backs Syria’s opposition. Annan gave no reason for not including the countries, although the U.S. has been adamantly opposed to Iran taking part. Russia, which along with China has twice protected Assad’s regime from U.N. sanctions and continued to provide it with weapons, has argued that the West should raise pressure on the Syrian opposition to sit down for talks with the government. Moscow has argued that the Syrians themselves must determine the country’s future and warned that it would firmly oppose any document urging Assad to step down. The meeting comes also at a time of regional tensions. Syria shot down a Turkish military plane last week, saying it violated Syrian airspace. Turkey denies that, but both sides have appeared keen to avoid escalating the matter. On Wednesday, al-Zoebi, the Syrian information minister, told Turkish TV that Syrian forces may have mistaken the plane for an Israeli aircraft. Syria and Israel are enemies. Associated Press writers Bassem Mroue in Beirut, John Heilprin and Frank Jordans in Geneva, Matthew Lee in Washington, Vladimir Isachenkov in Moscow and Albert Aji in Damascus, Syria, contributed to this report.